Not more than 30 hrs on 2016 7' 7' Zodiac inflatable and 2.5 hp Suzuki 4 stroke. 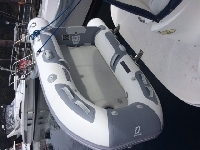 Inflatable includes bilge pump, air pump, oars, seat and spare floor. Paid $2800 for the pair, asking $1750. Can be seen on Gayle Warning, shed B15.